Reno Aces General Manager Emily Jaenson, left, Manager Chris Cron and President Eric Edelstein show off the skipper’s new uniform Tuesday at Greater Nevada Field. New Reno Aces manager Chris Cron has plenty of managerial experience and insight of the organization and how to develop its prospects for the big leagues. 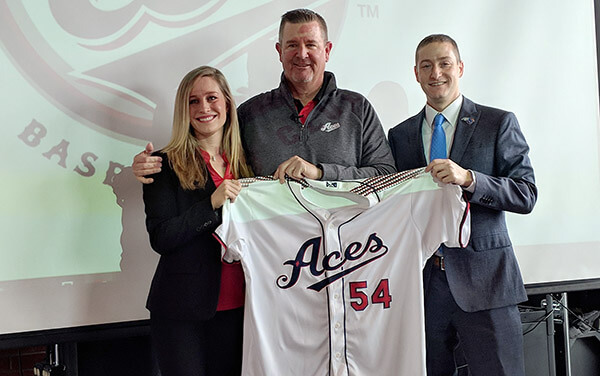 The fourth Aces manger in the team’s 11-year history was introduced to the Biggest Little City’s press corps on Tuesday at Greater Nevada Field. The new skipper enters his 35th professional season as a manager, coach or player. It’s his sixth season with the Arizona Diamondbacks’ organization, having served as a minor league coordinator for the past five seasons. Cron has 19 years of managerial experience at every level of the minor leagues and has a .495 winning percentage (1,127-1,149). Reno is a Triple-A team, the highest level of the minor leagues. It plays a 140 game regular season. Eight former Aces from last season are on Arizona’s 40-man roster. The Aces were 72-68 last season, finishing in second place behind the Fresno Grizzlies in the Pacific Coast League’s Northern Division. The Aces won the Pacific Coast League Championship in 2012 and have four division titles. The new manager is the father of Kevin Cron, 25, who played first and third base for Reno last season. He led the team with 22 homers and 97 RBIs in 104 games. He was added to the Dbacks 40-man roster in the offseason and will compete for a starting spot in spring training. Kevin Cron’s 6-foot-5, 245-pound frame seems like a natural fit at first base, but he showcased improved range and a strong arm at the hot corner last season. His defensive versatility to play both corner spots is complemented with good home run power. Chris Cron certainly will have a familiar face by his side in the dugout in bench coach and former Reno manager Greg Gross. Gross had a 152-130 record in two seasons at the helm of the Aces. As a player, Gross batted .287 over his 17-year career with the Houston Astros, Chicago Cubs and Philadelphia Phillies and will offer valuable insight as the season progresses. Cron will inherit a team that plays in a hitter-friendly ballpark. The Aces ranked third in the PCL last season in batting average (.284), second in hits (1,377) and third in home runs (156). Reno’s high desert elevation is an advantage for hitters, especially when the wind blows toward right field, which is usually the case. The Aces open the season on the road, playing April 4-8 at Fresno. A seven-game homestand begins at Greater Nevada Field on April 9 with a game against the Albuquerque Isotopes. Notes: Aces infielder Juniel Querecuto is starting at shortstop for Venezuela in the Caribbean World Series. On Monday at Panama City, he went 2-for-3 with an RBI in the fourth inning to help Venezuela win its opening game, 5-1 over Mexico. … The Aces will play the Nevada baseball team in an exhibition game at 6 p.m Tuesday, April 2, at Greater Nevada Field. … The Arizona Diamondbacks traded right-handed pitcher Jake Barrett to the San Francisco Giants for cash considerations Wednesday. Barrett appeared in 42 games with the Aces last season, sporting a 4-0 record and 2.87 ERA. He was designated for assignment by Arizona earlier this offseason. … The Diamondbacks signed left-hander Lucas Luetge to a minor league contract Monday. Luetge, 31, has totaled 111 career games with the Seattle Mariners. Luetge appeared in four games with the Norfolk Tides in 2017, Triple-A affiliate of the Baltimore Orioles. He did not play last season.